"We always put the low folio on the front"
"We always put the low folio towards the grip"
"We always rotate the folding lay towards the center of the sheet to minimize cuts"
"We position the smallest section TWO in from the low folio when there are less than 10 signatures"
"We have to allow a non-printable region to accommodate a slow-down wheel"
"We always lay 28pp A5 as 3x8pp, 1x4pp on a single sheet EXCEPT when the quantity is greater than 9999 and then we run them as separate sheets!" If we want to automate, then the imposition created by the MIS has to be how production require it. But each company has so many variables and personal preferences that I don't believe there is an automatic one-size-fits-all way to do this. What people seem to want is for the MIS to automatically come up with the layout that they would have selected manually! We've been working on a way for our customers to 'teach' their MIS the way they want to impose different products and different parts, based on different criteria. This journey for us started when we became a member of CIP4, an unusual but long overdue collaboration of print industry partners with one common goal - to automate the communication of job information through a printing workflow. I say unusual because competitors had to work together for a common good. I still remember the first few sessions - it was a strange but liberating feeling to be able to talk to people who do the same thing as you do and to share your experiences with someone who understood where you were coming from. I continue to attend these sessions and find them as enjoyable now as I used to do. It became apparent after a few years that MIS-to-prepress connectivity was pivotal and CIP4 made great strides in trying to facilitate this communication. But it still always felt like all of the knowledge was held in prepress and the MIS was only sending a rough idea of the layout for prepress to interpret and make good. On the whole, that did work, but one of the challenges that has remained unconquerable in my opinion is change control. Once the job has commenced its journey into the workflow, once it's left the MIS and is now squarely within the prepress, how do we manage those changes that prepress have to make? Some systems that are out there are completely integrated on the same platform and are in the best place to overcome this. But, this is rare and in the lion's share of deployments, once the job arrives in prepress, everyone else is at the mercy of what they decide to do with that job. And while prepress have to make changes to that job to make it appropriate for production, and while they are making these changes based on their knowledge and experience, the rest of the workflow then has to deal with it. 1. Communication back to the MIS may be lost, which will affect feedback of job status and costing. It may also break the workflow if the MIS has been tasked with moving jobs from prepress down into a digital workflow. 2. The integrity of the workflow is broken. What is sent to press might be totally different to what the MIS told it to expect. For example, the MIS sends a work-and-turn imposition, and prepress changes this to a sheetwise imposition. We now have a completely different number of surfaces and plates to what the press was expecting. Some prepress systems have gone a long way in trying to communicate this information back to the MIS but honestly, it's typically too late or too difficult to flush that information into the relevant areas for each job. There are just too many implications to cater for. Moving from one press to another is something that is fairly trivial and easy to accommodate, but the more complex items such as substrate change and job structure change have a big impact on purchasing, costing and production planning. When these changes occur, the whole integrity of your workflow collapses. Even in a manual environment, someone has to update the job to ensure that those changes are accounted for. I'm sure you get the idea. Here at Tharstern, we now have what is the culmination of many years of painful workflow deployment experience, of constantly running into these exceptional prepress decisions and the unavoidable damage they do. We have created something that can capture these exceptions, so that what we're sending to the workflow is as correct as we could possibly make it. We've called this new tool the Layout Library. It essentially allows our customers to take their 'imposition bibles' and teach the MIS the way they want to work. They can control all the flipping and rotating of their signatures and sheets to fit in with their equipment and workflow, they can specify what makes up the total number of pages in a profile, how many and what type of signatures make up the sheet and how those signatures are accurately positioned relative to each other. 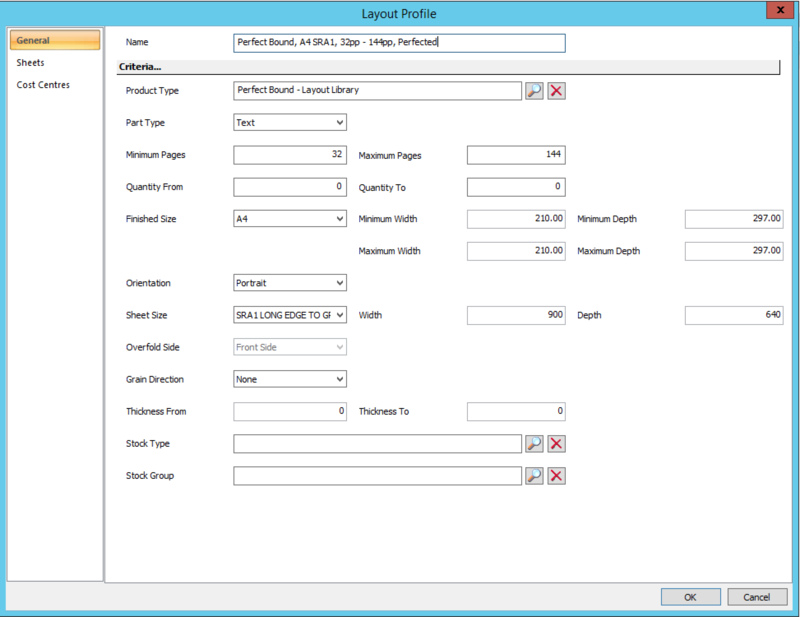 These Layout Profiles are then assigned product types and criteria, for example: substrate, run length, orientation, grain direction, sheet size and finished size. This then means that the estimating engine within Tharstern knows which imposition to select for that product type and situation. The layouts can be associated with different equipment e.g. one imposition for digital and one for offset litho, one imposition for a booklet maker and one for conventional binding. What's really cool is that unlike some systems, our Layout Library doesn't have to be size specific. This means profiles can be size agnostic, for example: a 16pp A5 planned SRA2 is essentially the same as a 16pp A4 planned SRA1. 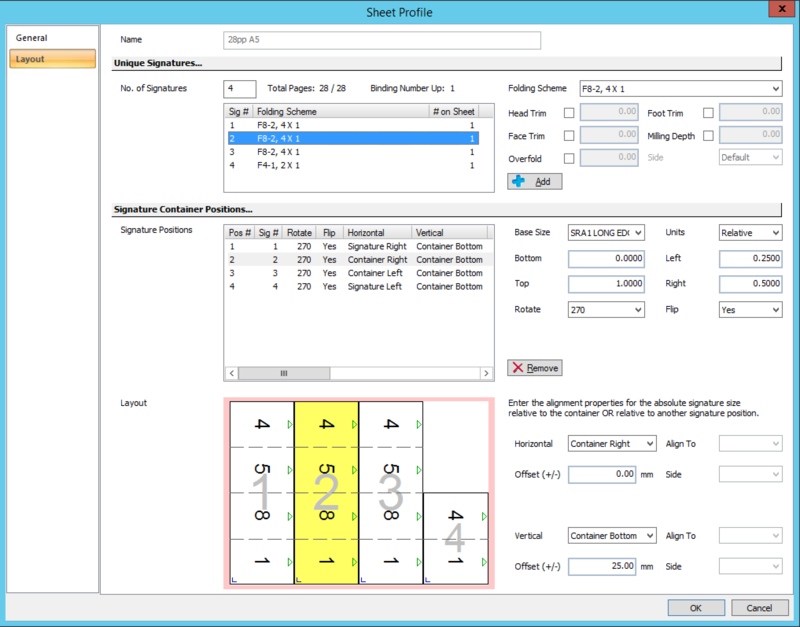 It also allows for cut-star support with variable cut-off and you can also set different layouts for situations where the imposition needs to be different because of some other post-press process such as die-cutting. I think we all accepted some time ago that printers have to automate wherever possible if they want to remain competitive in today's printing industry. It's not the only thing that they need to do, of course, but they DO need to do it. However, automation has an Achilles heel - if the flow of information is incorrect and people have to start making manual amendments to correct it, then all the efficiencies you've created elsewhere are lost. So, if you want to remain competitive in the market, you have to make sure that your prepress department is not spending a significant amount of time correcting jobs. Whether this is in an automated workflow or a manual workflow that relies on accurate job instructions flowing through from one department to another, you have to eliminate unnecessary changes wherever possible. 1. Involve your prepress team with your MIS team and in particular, your estimators. 2. Create your production standards and ensure your estimators are fully briefed about the way you want to work. 3. Give someone the responsibility to review job specifications before being sent into production i.e. make the change before. The important thing I'm trying to get across here is that if you want to stand out from the crowd, you need a workflow that's driven by the MIS but encapsulates the unique expertise of your prepress team and your company specific production requirements. This is something that can only be achieved by bringing your MIS and your prepress teams together, working as a united team with a common goal.